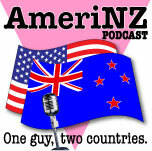 » AmeriNZ 176 – Live Chat on Healthcare AmeriNZ Podcast: One guy, two countries. This episode was delayed due to some technical problems. It’s mostly unedited. The healthcare reform “debate” in the US has been more like a schoolyard brawl, and most Americans are no more enlightened now than when it began. Yet polls show the vast majority of Americans want healthcare reform along the lines of what President Obama proposed. Joining me for the live chat were by LurryDean, Larken and Steven in Wisconsin. We being by talking about where things are and where they seem to be headed. Daniel Brewer joins us to talk about the nature of how the insurance industry works, something that shapes the entire reform debate. We end up talking about a lot of related topics—and a few not so related. I still need a sign-off phrase—email me your suggestions! It’s possible that there won’t be a group show on Thursday, October 1 Americas/Friday, October 2 in New Zealand & Australia. Watch this site for more details. Join us on for the group chats on Pride48.com for a wide-ranging discussion. The live chats start at 8pm Eastern North American time on Thursday (1pm Fridays New Zealand time). Check this amerinzpodcast.com for any updates. 1 user commented in " AmeriNZ 176 – Live Chat on Healthcare "
Wow. That was one of the best discussions on Health Care Reform that I’ve heard in a while. I wish I could have been there to join in with my 2 cents from DC. I’m guessing I might have to rescheduled my Gym nights to be able to listen live!!! And Gosh Darn it. I’m so mad that the Senate Finance Committee today crapped out on the public option. I’m so over how in bed these folks are with the health insurance companies. Grow a spine and do what the people who vote for you want or we will replace you with someone who will. Ugh. I’m disgusted right now.